Raising Five: Women's ministry - in real life! Women's ministry - in real life! Awesome women's council meeting last night! Lots of great ideas - lots of excitement! Lots of confirmation that all your thoughts on this are truly on the pulse of what women in my real-life sphere are looking for, too. Thank you! Relationship, fellowship, friendship. All based on our common bond as women in Christ. 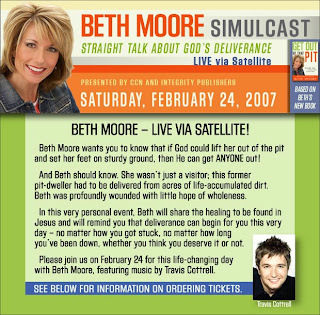 Look for a simulcast in your area - we'll be getting out of the pit, all together! Wish I were in that group - sounds so wonderful - I LOVE Beth Moore!! Sounds like you are on to a great idea!! WE are doing this in our area. So neat that we are all experiencing it together across the country! WAH!! So far no church in my area is participating in the Beth Moore program. I will keep checking though. Have you read her new book? I have enjoyed reading your blog. I will be in your shoes in a few years. (a teen through toddler) I have 5 kids ages, 11, 8, 6, 3, and 6 mths. I went to the last Beth Moore simulcast and it was great. Hate that I'll miss it this year, but our church is having a marriage retreat that weekend. That's pretty cool. We're starting a Beth Moore study in one of our new women's home teams this next week!